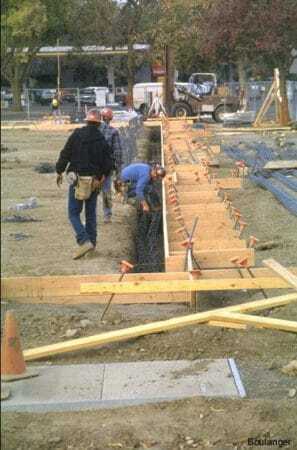 Grade beams are commonly concrete beams which are designed to act as horizontal ties between footings or pile caps. 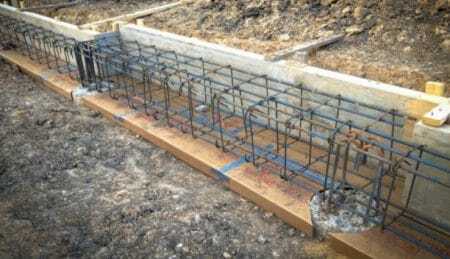 They should be reinforced with continuous reinforcement that is developed within or beyond the supported column, or be anchored within the pile cap or footings, ACI 318-14. The grade beam either rests directly on the soil or above the soil spans between piles. 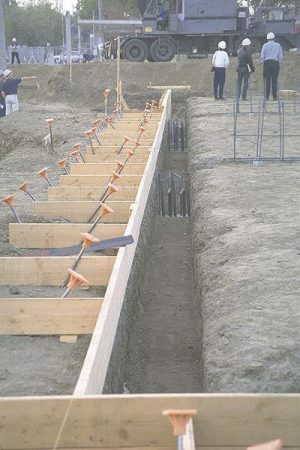 A continuous grade beam footing will transfer the load of a building to the ground or to its bearing points where their bases distribute the load to the soil. In this article, construction process of reinforced concrete grade beam will be discussed. Trenches for the grade beam is excavated Based on its level. Alternatively, if the grade beam is constructed directly on the ground, then the ground surface will be leveled and prepared. Where the grade beam is used between piles as shown in Fig.1, construction preparation and excavations will begin after finalizing pile construction. However, excavation of trenches for the grade beam will be executed along that of footing when the grade beam is used with footings. Finally, if the grade is constructed above the ground surface, then installation of forms will be the first step in construction process of grade beam. After the site preparation and excavation of trenches is completed, then forms will be placed according to the dimensions of the beam which shall be provided in the design drawings. If the grade beam is constructed on the ground, then the bottom of the form shall be placed prior to its sides. In this case, flat soling brick is formed along the grade beam instead of bottom shutter. 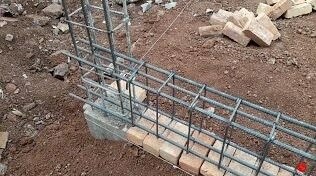 After that, either the reinforcement cage is placed on the flat soling brick before side shuttering is fixed or one side of the form is placed followed by installation of reinforcements. If the grade beam is constructed above the ground, then the formwork construction would be similar to that of conventional beam. So, shutters shall be placed for bottom, and both sides of the grade beam. In this case, formwork can be fixed completely followed by reinforcement placement, or fix only the bottom shutter then place reinforcements, after that install side shutters. These construction sequences are selected based on ease of construction and convenient. Lastly, after the completion of grade beam formwork, insure that designated grade beam dimensions are provided including sufficient reinforcement cover. added to that, shuttering strength, waterproofness, strength of supports of grade beam formworks, verticality of side shutters, and location of grade beam shall be checked as well. After finishing shuttering or placement of flat soling bricks for the bottom of the grade beam, reinforcement placement begins directly or after side one side of the formwork is placed. Necessary reinforcement detailing such as size and number of longitudinal reinforcements and its required length, number and spacing of stirrups are provided in structural drawings. Finally, number and size of top; bottom; and extra reinforcements, lap length and placement, hooks,spacers, and clear reinforcement cover shall be checked after reinforcement placement is finished. 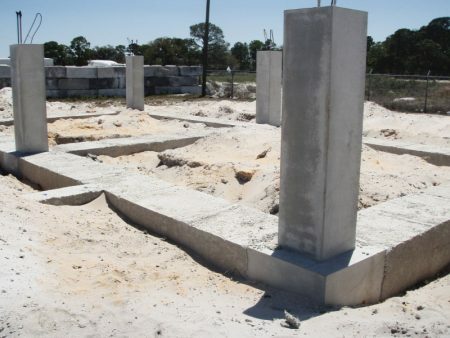 Grade beam can be casted with ready mix concrete or on-site machine-mixed concrete. The former is desired if the concrete volume is large. 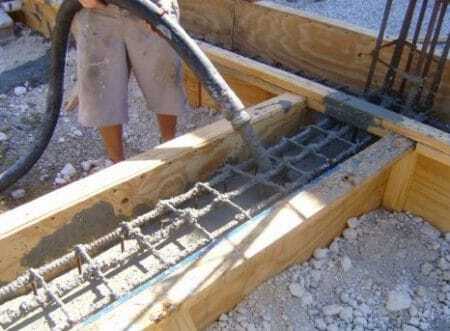 If ready mix concrete is used, then concrete supplier needs concrete strength only. However, if on-site machine mix concrete is employed then ratio of concrete constituents shall be found. Poured concrete shall be compacted adequately using vibration equipment or any other suitable means, then finish the top of grade beam. Finally, the side-shutter of grade beam can be removed 24 hours after pouring concrete. However, bottom shutter cannot be removed till concrete achieve its strength. This time duration for stripping bottom shutter depends on the clear span of the beam.